Mike Schulz Pin Up Photographer - Amazing style! "My professional career started by shooting dancers and dance schools, from there I moved to Models and Actors and my next big move will be in to Video as many clients are now asking for web content." "Favourite shoot ever was the iCapture website launch shoot. I had a white wall studio, 4 Models, a stylist, a hair stylist, 2 makeup artists and 2 assistants." Who is your fav photographer? "Jasin Boland. Ever since the Matrix stills/advertising shots, this photographer has inspired me. Capturing people during live action that cannot be recreated anywhere else truly is an art." "I have been running iCapture for about 3 years but have been shooting for over 15!" 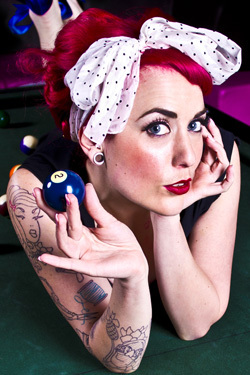 "Canon 7D with L-series and prime lenses"
Why are you so interested in Pin Up Photography? "I love the fashion and alternate personalities it can bring out, anyone can be a Pin Up model for the day!" What are your favourite pin up poses for photo shoots? "My favourite poses are that of the innocent shocked face, giving the “I’ve just been caught!, Oops!”"
What makes a great pin up model? "I think a great Pin Up model is anyone who can put a lot of emotion in to every shot and not holding back or feeling self conscious." Mr. Mike Schulz Pin Up Photographer - Who are your pin up girl idols? "Betty Page got me in to Pin Up and watching her documentary gave me a sense of appreciation for how it all began"